Note: While you can make this tutorial work with Xcode 10, you cannot use Swift 4.2. Couchbase is installed as a pre-compiled framework built with Swift 4.1, thereby requiring the whole project to be built with Swift 4.1. Until Couchbase is updated, we recommend you use Xcode 9 for this tutorial. Couchbase is a NoSQL data platform that extends from servers down to mobile devices. It’s a document-based data platform in use worldwide by a large variety of companies and organizations. Sync Gateway, a secure web gateway for connecting to Couchbase Server. In this Couchbase tutorial, you’ll develop an app to run Ray’s new pizzeria. The app will allow customers to place orders and will also let Chef Ray monitor pizza production and update his fabulous menu. Note: Because this project uses Couchbase and Fakery CocoaPods, you need to open RaysPizzeria.xcworkspace, not RaysPizzeria.xcproject. Build and run the project in Xcode to see the basic UI. 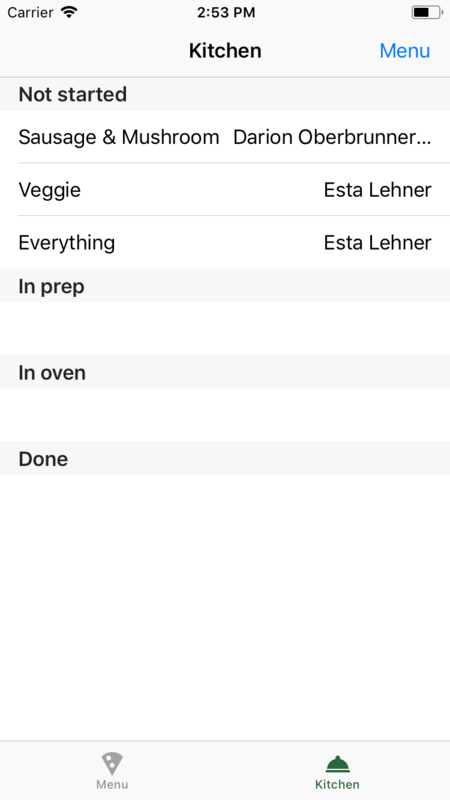 The UI has two tabs: Menu and Kitchen, but not much functionality. Select a pizza from the Menu tab and you’ll see an empty customer screen. Tap + to generate a customer, which then gets added to the UITableView. When you select the customer cell, a UIAlertController pops up asking you to confirm the order. Note: The customer data is supplied using Fakery, a framework intended for unit testing. Go back to the menu and select another pizza. Notice that your previous order and customer are no longer there. Oh no! Now look at the Kitchen tab. Ray and his kitchen staff have no idea what pizza to make or who placed the order. To solve this problem, Ray asks you to implement a database-driven app. So what are you waiting for? It’s time to get cookin’. 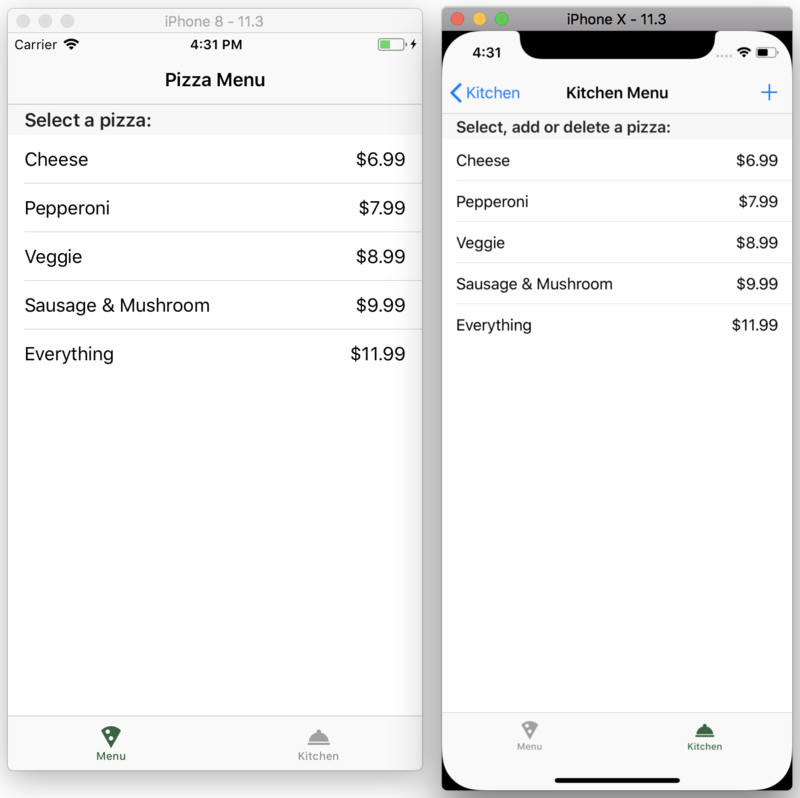 Open MenuViewController.swift and take a look around. 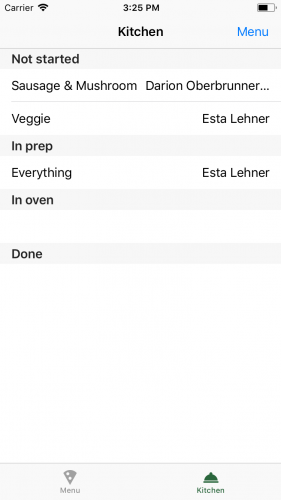 It’s a basic UIViewController with a UITableView that displays the menu. In viewWillAppear(_:), the menu is loaded with menu = DataManager.shared.getMenu(). Open DataManager.swift and locate getMenu(). This loops thru the Pizza.PizzaType enum, creates a Pizza object and then adds it to the menu. This is fine until you need to change the menu items and their prices. To solve this problem, you’ll load the menu from a database instead. private let databaseName = "pizza-db"
Get the path to the pre-loaded database from the app bundle, a read-only location, and copy it to a read-write location. Database.copy(fromPath:toDatabase:withConfig:) copies it to the app’s Application Support directory. Build a query that retrieves all pizza documents from the database and orders them by price. SelectResult.all() returns all property data from a pizza document. The document id (used in future queries) is not part of the property data, but rather is part of the document metadata, so you use SelectResult.expression(Meta.id) to retrieve it. Execute the query and loop thru the results. Get the name, price and id from the database and create a Pizza object. 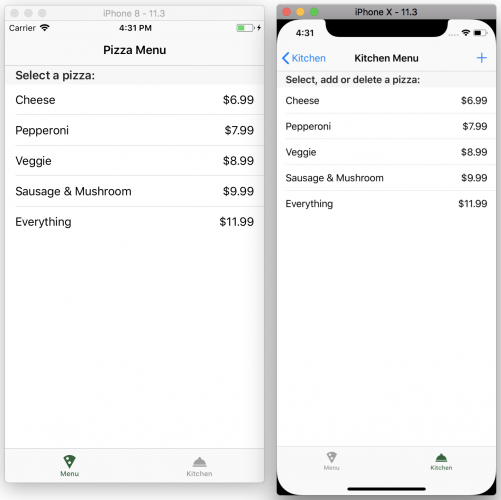 Append each Pizza object to menu and return menu. Perfect! The menu loads from the database, but customers and their orders are not getting saved. You’ll fix that next. Similar to getMenu(), you build a query to get all the customer data from the database. Execute the query and get the data values from the result dictionary. Create a Customer object and add it to customers. Create a MutableDocument and store the Customer properties in it. Save the document to the database, creating the document’s metadata: id. Select a pizza and add a few customers. Then, go back to the Menu tab, and select the pizza again; notice your previously added customers are now there. Create a MutableDocument and store the Order properties in it. Save the document to the database. This adds the new order to the database and reloads the table view with the new order data. SelectResult.expression(Function.count(Expression.all())) requests the count of all items instead of returning the items themselves. .and(Expression.property(OrderKeys.customerId.rawValue).equalTo(Expression.string(customer.id)))) is part of the where clause, and indicates to only return documents where the customerId property is equal to customer.id. orderCountLabel.text = "(orderCount)n(orderCount == 1 ? 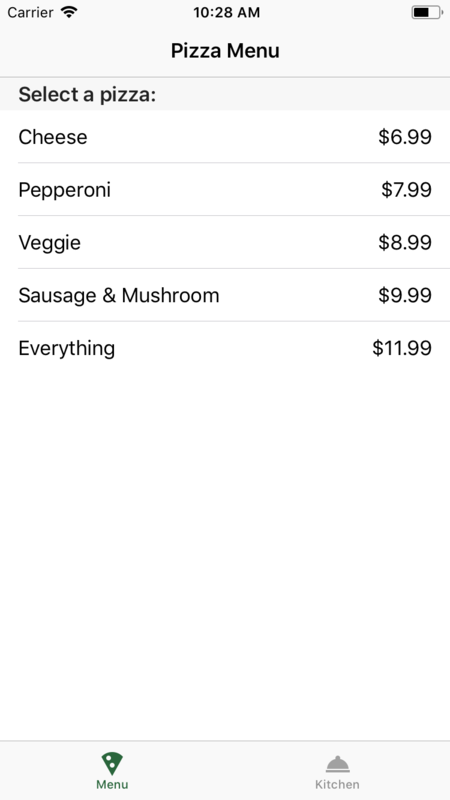 "Pizza" : "Pizzas")"
The Menu tab is fully functional now — a customer can place a pizza order. However, the kitchen staff still doesn’t know about the orders. Creates a query for all orders. Loops thru each document and gets all of the property values and id. Creates an Order object and adds it to the orders array. This loads all of the orders. If you look at Order.swift, you’ll see the properties: id, pizzaId, customerId and state. 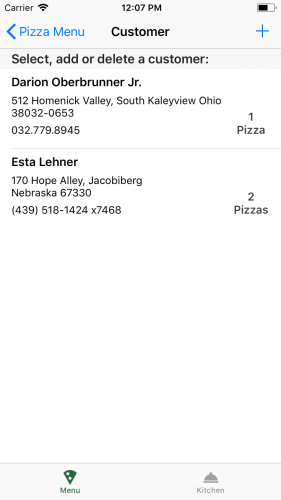 To display order information, you need to retrieve the pizza and customer data using their respective id’s. This queries the database for the document with the specified id and returns a Pizza object. This returns the Customer object for the specified id. 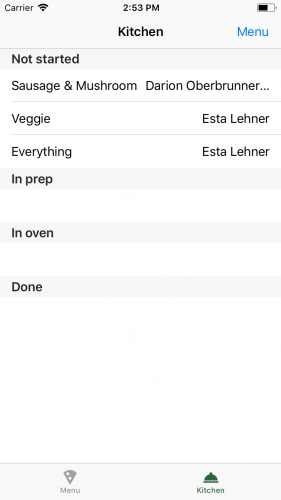 Selecting an order in the Kitchen tab displays a UIAlertController, however, nothing happens when you tap Yes because you haven’t implemented a way to update the order’s state in the database. Calling database.document(withID:) returns an immutable document, but a call to toMutable() returns a mutable copy so you can update it with the new order values. Calling database.saveDocument() saves the updated order. 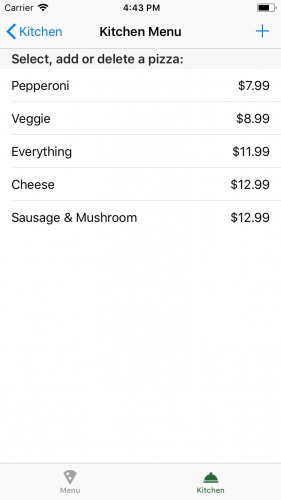 Now you can tap an Order cell and move it to the next kitchen state. This loads the menu from the database. Selecting a cell or tapping the + presents the PizzaViewController. 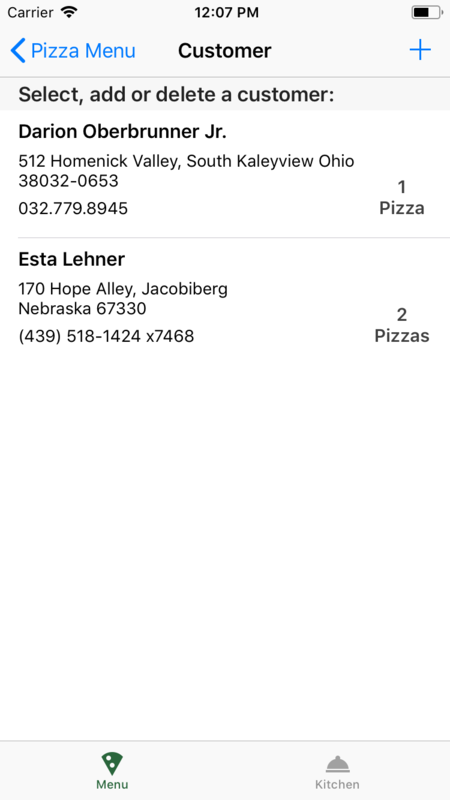 If selecting a cell, it loads the selected pizza properties into the appropriate text fields and allows you to update the values. Tapping + loads them with defaults of “Cheese” and “$5.99”. Tap Save to update pizza or add a new pizza to the menu. However, you need to add some code to save it to the database with the updated or new pizza menu items. The add() and update() functions are similar to those previously added, and there’s nothing unusual in delete(), just get the document and call database.deleteDocument() to delete it. In Kitchen Menu, tap the Cheese cell, change the price to $12.99 and tap Save. Excellent! 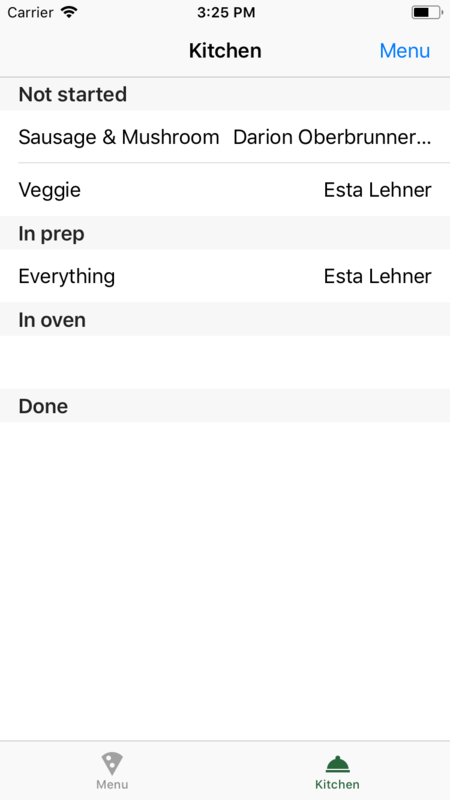 Ray now has full control over his menu; he can add, update and delete items on the menu right from within the app. In production, you’d use Couchbase Server and Sync Gateway; both installed on a server in some data center. The app would talk to Sync Gateway and handle the data synching between the server and mobile apps. However, you’re going to run Sync Gateway locally in walrus mode, which is an in-memory, development-only mode. You should see Starting server on localhost:4984 ... in your Terminal window. Great, Sync Gateway is running! It’s time to replicate the database to the local server. Set up the replicator configuration and create the replicator. Notice the URL scheme is ws: instead of the usual http:. Couchbase Lite 2.0 uses WebSockets as its communication protocol. replicatorConfig.continuous = true keeps the replicator active indefinitely waiting to replicate changed documents. Listen for document changes and post a notification. You’ll add observers below to update the UI when these changes occur. You’ll see GET /pizza-db/_blipsync (as GUEST) in the Terminal window running sync_gateway. You can see more information from Sync Gateway’s Admin panel (http://localhost:4985/_admin/db/pizza-db). Add a new customer. Refresh Sync Gateway’s Admin panel, and you’ll see a new file. Select the file to see the contents. To simulate multiple users, you can run the app on a second simulator. In Xcode, select a different simulator in scheme run destination. You’ll see two simulators with one running RaysPizzeria. Tap the app icon in the other simulator to run the app. To see changes in one simulator affect the other, make a few menu changes. In simulator one, select the Menu tab. In simulator two, select the Kitchen tab, tap the Menu bar button, select a pizza and change the price. Once you tap Save, the menu will update in simulator one. Couchbase is a great platform for app development, especially if your app is data-driven. You may have noticed that Couchbase Mobile does not require an additional networking layer/framework to download data or JSON parsing. Connecting your app to a Couchbase Server requires Sync Gateway and adding a Replicator in your code. For more information about Couchbase Lite, check out their documentation. More detailed API documentation is here. You barely touched what’s available in the Query API. If you’re feeling adventours, expand the queries within this app. 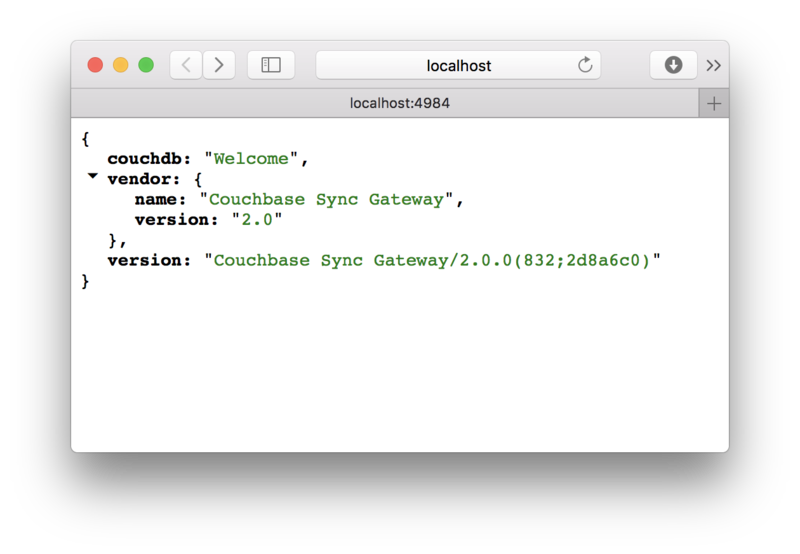 We hope you enjoyed this Couchbase tutorial on Couchbase for iOS. If you have any questions or comments, please join the forum discussion below! Top 5 Hidden jOOQ Features – Java, SQL and jOOQ.